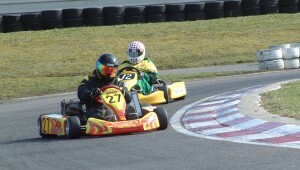 An almost dry track and an encouraging forecast, greeted the teams for this, the second round of the championship. 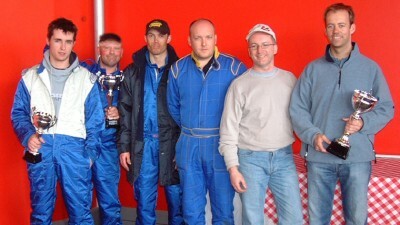 The Biland of Special Racing Projects (SRP) took pole by some considerable margin from the Pro Max of Mister Igloo, with two more Bilands namely Lakeside and No Cigar making up the second row. From the drop of the flag, SRP went off like a rocket leaving the other Bilands and Pro Maxs unable to live with their pace, whilst the Biland of SRT failed to make the start. The seven lap advantage was quickly awarded to the Pro Kart and World Engine formulae with Spencer Motorsport now showing at the top of the leader board from the Pro Kart of SRT Nail. With just over half an hour completed, Lakeside's Biland lost a rear wheel hub which took an age to rectify and effectively put them out of contention, similarly Le Maverick's Biland suffered a steering bolt failure, consequently losing them a considerable number of laps. Meanwhile SRP were a country mile clear of the nearest opposition No Cigar and Mister Igloo's Pro Max, and the lead to Spencer Motorsport's WF kart had already been reduced by 2 laps. As the variant fuel requirements of the different formulae started to take affect, Box Tech's Pro Max moved up to 3rd place followed by half a dozen Thunder Karts lead by Bad News from RJB, Team Oblivion, Team Slick, SAS Racing and Mojo. At one third distance, SRP were up to 2nd place in front of the string of Thunder Karts and now only 3 laps behind the leaders Spencer Motorsport. Disaster then struck the leaders and Spencer Motorsport were forced to pit with a carb problem, allowing SRP through into the lead with Mister Igloo now in 2nd place. With an hour and a half to go, the Thunder Karts of Bad News and Team Oblivion moved up into 2nd and 3rd place respectively, with No Cigar and Mister Igloo putting in brief appearances whilst the last fuel stops took place. The recovering Spencer Motorsport then had a further disaster with a sheared stub axle, putting paid to their day, whilst SRP were now 6 laps clear of 2nd place Bad News, and looking unstoppable. 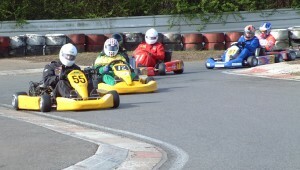 As the Pro Max's made their last fuel stops, the Thunder Karts were all queued up for the remaining podium places but with no hope of catching the leaders SRP. Disaster then struck as SRP came in for a 'splash and dash' and then failed to restart the engine due to an electrical problem. Like vultures at a prey, the Thunder Kart train, honed in on SRP's lead whilst they frantically worked in the pit lane to rectify the problem. With minutes to go before the chequered flag, SRP rejoined the race, but alas to late. The Thunder Karts of Bad News, Team Oblivion, Team Slick and SAS Racing has already passed Special Racing Projects whilst they were still in the pit lane and made it a clean sweep for the Thunders.